Playdough Bubble Bath. It’s like two of the greatest things in the world colliding into one ball of awesomeness according to my kids. Between squishing and shaping the playdough and the bubbles from the bubble bath, it’s just so much fun. But the store bought version is so expensive, and I was going broke buying the their precious bubble bath playdough! After doing some playing around we have come up with our own homemade bath playdough recipe that the boys love making and using! 1/4 cup Bubble Bath – I like to use a more natural product with no additional scents (we add essential oils to create our own scents), but you can use your favorite bubble bath. 1 tsp Coconut Oil – You can substitute sweet almond oil or grape oil, but we always have coconut oil in the house, so that’s the easiest for us. You can also leave out the oil if you wish, and simply increase the bubble bath a bit. It is so dry where we live, the oil really helps my son’s skin. It also gives the play dough a much smoother, silkier feel. In a bowl mix together the bubble bath, essential oils and add the food coloring (if you want uniform color or leave it until later for a marble effect). Melt the coconut oil in the microwave if it’s solid, then add that to the bowl. Finally, add the corn starch. Start with 1/2 cup and mix it in, if it doesn’t pull together add another 1/4 cup of corn starch and continue mixing. As you mix it will pull together into a nice, solid ball. Start kneading with your hands to really mix it all in. This is a great activity for the kids to do. There may be some extra corn starch left in the bowl, that is fine. Simply discard it. If you wanted the marble effect, add the food coloring now to your bubble bath play dough, or leave it creamy white for a beautiful, natural finish. Store in an air tight container and use within a week. We found it started to dry out and pull apart after a a few days. Of course, once you are in the bath and getting it wet, you don’t notice that anymore. 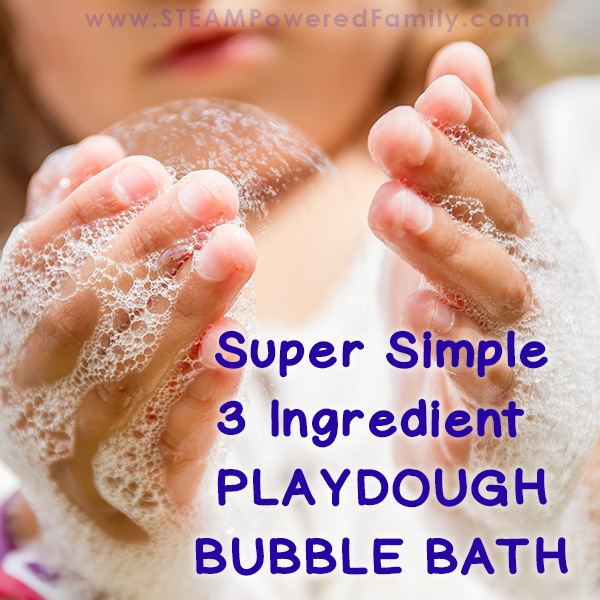 To use simply give your child about a tablespoon sized ball of the playdough bubble bath to play with in the bath. Holding it under the water will help create more bubbles. You can also use it in sensory play, as part of a water table, for your kids to use when cleaning toys like Lego, and so much more! 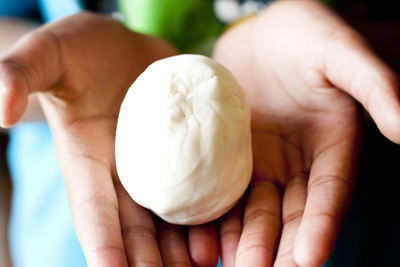 The making of this diy playdough is also a fantastic sensory experience and fine motor strengthening activity. Looking for a kid made gift idea for Mother’s Day, Birthdays or some other special event? Why not make some homemade playdough bubble bath, package it up in a mason jar and decorate the jar. This great recipe makes a fantastic gift! Not getting enough bubbles with your homemade playdough bubble bath? If you are running into issues with your playdough bubble bath just not creating enough bubbles, try using a different bubble bath. You want to pick one that makes a LOT of bubbles before you use it in this recipe. If you use one that just foams or creates minimal bubbles in it’s normal state, it will not be great at making bubbles in playdough form. For those that follow my blog you will recognize that essentially we are making a non-newtonian fluid here, we are simply adding more corn starch to obtain the desired play dough consistency. If you add too much of this to your bath water you will create oobleck. Now the ratio to create oobleck is 2:1, so you would have to use a LOT of this play dough to reach those ratios (2/3 of the bath tub would need to be play dough! ), but still, use common sense and don’t give your kids too much of this in the bath. If nothing else, it could get very slippery! We have found the perfect amount is a nice tablespoon sized portion per bath. 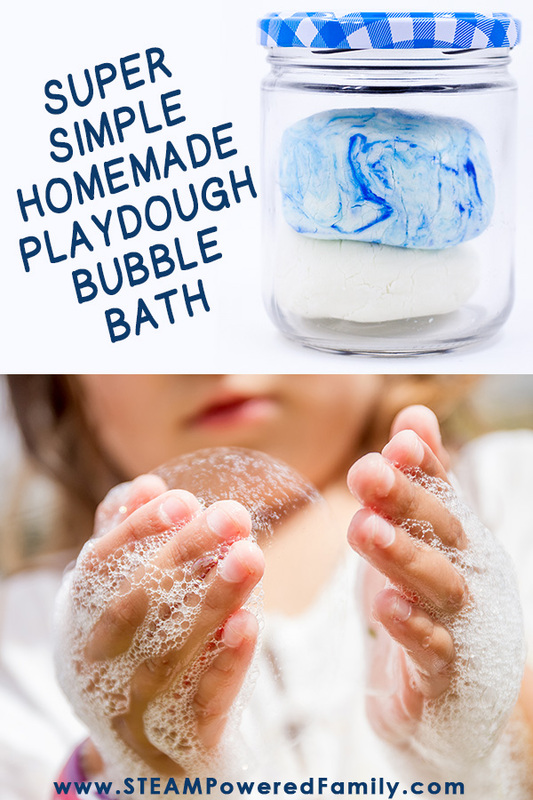 This Playdough Bubble Bath is a great way to save money, but most of all, have fun! Happy playing, learning and exploring! Looking for more fun ways to play and learn? I will definitely be making this! If I post about it then I will be sure to link back to your blog for credit:) Great idea! My little nephew would love this! Pinned! Eeek! My kids love play doh, this will be perfect for bath time! Oh wow! I’ve never heard of bath playdough. I’m sure my toddler would thoroughly enjoy this! We’ve made this but not with coconut oil. Definitely need to try this!!! I’ve made playdough with hair conditioner, but never bubble bath. Thanks, I’ll give it a go! Excited to try this! Do you think it would bubble enough if I use liquid Castile soap?